How are lysosomes and peroxisomes produced? Lysosomes are the cells' garbage disposal system. They degrade the products of ingestion, such as the bacterium that has been taken in by phagocytosis seen in the above cartoon. After the bacterium is enclosed in a vacuole, vesicles containing lysosomal enzymes (sometimes called primary lysosomes) fuse with it. The pH becomes more acidic and this activates the enzymes. The vacuole thus becomes a secondary lysosome and degrades the bacterium. Lysosomes also degrade worn out organelles such as mitochondria. In this cartoon, a section of rough endoplasmic reticulum wraps itself around a mitochondrion and forms a vacuole. Then, vesicles carrying lysosomal enzymes fuse with the vesicle and the vacuole becomes an active secondary lysosome. A third function for lysosomes is to handle the products of receptor-mediated endocytosis such as the receptor, ligand and associated membrane. In this case, the early coalescence of vesicles bringing in the receptor and ligand produces an endosome. Then, the introduction of lysosomal enzymes and the lower pH causes release, and degradation of the contents. This can be used for recycling of the receptor and other membrane components. See the Web page on Receptor mediated endocytosis for more information. Lysosomes carry hydrolases that degade nucleotides, proteins, lipids, phospholipids, and also remove carbohydrate, sulfate, or phosphate groups from molecules. The hydrolases are active at an acid pH which is fortunate because if they leak out of the lysosome, they are not likely to do damage (at pH 7.2) unless the cell has become acidic. A Hydrogen ion ATPase is found in the membrane of lysosomes to acidify the environment. Lysosomal morphology varies with the state of the cell and its degree of degradative activity. Lysosomes have pieces of membranes, vacuoles, granules and parts of mitochondia inside. 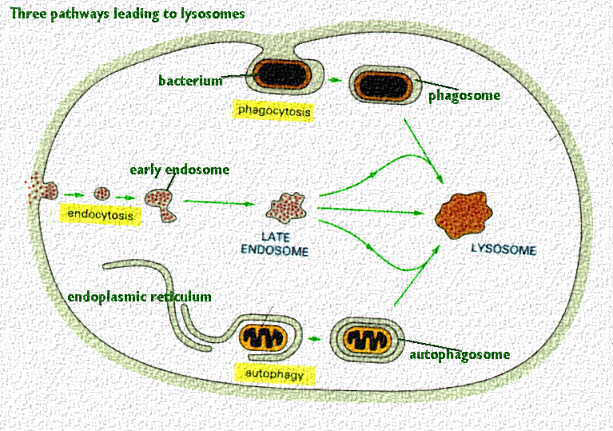 Phagolysosomes may have parts of bacteria or the cell it has injested. This electron micrograph shows typical secondary lysosomes. They have been detected by cytochemical labeling for acid phosphatase. This is a good marker for lysosomes. Recall that it is also used as a marker for the Trans Golgi Cisternae. How does the Golgi Complex sort lysosomal enzymes? Why peroxisomes are not like lysosomes.